For About $20, Cardboard Bicycle Could 'Change The World,' Inventor Says : The Two-Way The materials are plentiful and the process of twisting, shaping and lacquering makes for a frame that's strong and durable, inventor Izhar Gafni says. Mass production is supposed to start in the next few months. See video of a bike in action. 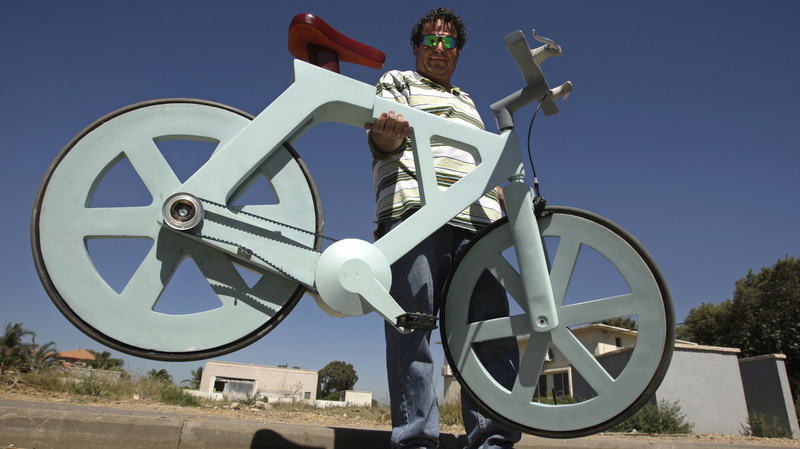 Israeli inventor and his cardboard bicycle. An Israeli inventor has come up with a way to make a bicycle almost entirely out of cardboard — and so inexpensively that he thinks retailers would only need to charge about $20 for one. The inventor, Izhar Gafni, believes the bike could be a boon to the world's most traffic-congested cities and help people in remote parts of the Third World get from place to place. He's reached a deal to start mass production in a few months, Gafni tells Reuters. How did he do it? As Reuters says, "once the shape has been formed and cut, the cardboard is treated with a secret concoction made of organic materials to give it its waterproof and fireproof qualities. In the final stage, it is coated with lacquer paint for appearance." This video posted by Gadizmo helps explain more about how the bike is built, and shows it in action.